Necklace Length:20+2 inches/Resizable,Pendant size:1.5 " x 0.9"
U7 Fashion Jewelry U7 Jewelry is made with German imported polishing and electroplating equipment. Main Method:Gold-plated Copper,platinum-plated Gold plated copper is a method of depositing a thin layer of gold onto the surface of copper. We produce and process various type of jewelry to meet different customer's need,such as bracelets & bangles,earrings, rings and jewelry set. Necklace Pendant necklace made of 18k gold,platinum plated,alloy,stainless steel gold and pearl,various pendant for example pearl pendant,diamond, floral,animal,cross,letters. 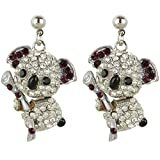 Earrings Gorgeous and shiny,diamond sparkling.Hoop earring,stud earrings,tear drop earring,round,oval,dangle.whatever back finding you want,clip on,screw back and so on. material:cubic zircon,rhinestone embellish the dangling drop earring,shiny, sparkling, which makes you the focus of the party. Bracelets&Bangles Made of stainless steel and gold which make it solid and charming.For men, women,boy and girls ,no age limit. Anklets Foot Jewelry, charm anklets. Rings For wedding,promise,fashionable. Jewelry set 2 pieces, 3-pieces, 4 pieces set.Good choice for wedding, party, anniversary gift to your mother, father, husband and wife,boyfriend and girlfriend,boss or employee,which makes you decent and graceful. Jewelry accessaries style£ºhip hop, fashion,romantic,vintage, religious and so on, search U7 jewelry,you'll never disappointed. Delicated,Durable and stylish,stunning,suitable for daily use,shopping,birthday,mother's gift,Christmas,Thanksgiving,Valentine's day Caring for your Jewelry Please try to keep it from water. Package content: 1 chain,1 pendant,1 bracelet,1 pair of earrings,gift box,paper card,OPP bag. 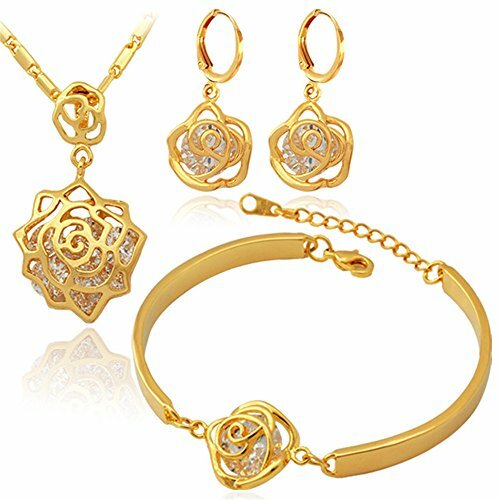 I was wondering where to buy U7 18K Gold Plated Wedding Jewelry Vintage Rose Cubic Zircon Pendant Necklace Bracelet & Earrings Set online, and thankfully found this store!